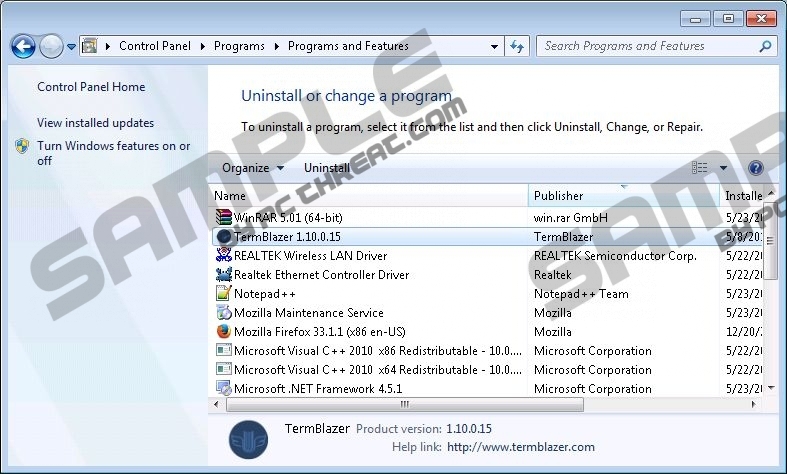 Termblazer is yet another adware program that has been roaming the web lately. Our reports show that quite a few users have their system infected with this invasive adware program. If, unfortunately, you are one of those users, you must know that removal of Termblazer is essential if you want to keep your PC clean, secure, and fully functioning. Even though Termblazer is advertised as an excellent tool that should enhance your web browsing experience, you should know that it does not do anything like that. What is even worse is that it has been discovered that this intrusive adware could turn out to be quite malicious. Do not take any chances with Termblazer, and remove it as soon as possible. Use the removal guide provided below, as it is easy to use and will help you delete this adware in no time. Termblazer is very similar in its functionality to adware programs such as SearchSnack, TerumTutorm, ClickAption, and many others. So, just like its counterparts, it will instantly flood your web browser with various third-party commercial ads and annoying pop-ups. This activity is extremely annoying and frustrating, as you will not be able to use your browser to its fullest. The numerous ads and pop-ups, even though they might seem tempting, are in reality utterly worthless. It is crucial to remove every single bit of Termblazer, as that is the only way to stop this intrusive activity. Unfortunately, there is something more to Termblazer. We have discovered during the research that in some instances ads or pop-ups provided by this adware could be implemented with redirect links. This is very dangerous, as you could be taken to various fake online shops or websites that promote malware. Landing on a fake online store is extremely dangerous because you could lose your sensitive data. Often fake online shops copy the design of a well known website in order to lure you into entering your credit card data. If you encounter an online stor that looks questionable, make sure to learn as much as possible about it before making any purchase, because you could hand over your credit card data without even realizing it. This obviously is a dangerous situation, and is the main reason removal of Termblazer is a must. The removal of Termblazer should be carried out with your utmost attention because incomplete removal could have dangerous consequences, since just a few leftover files could be used to silently restore this adware program. This is why you should scan your PC with a professional malware detection and removal tool, as it would remove any leftover traces associated with Termblazer. Select Termblazer and click Remove. Right-click Termblazer and select Uninstall. Quick & tested solution for Termblazer removal.